Beautiful modern family home built by Gatestone Homes combines contemporary style with family friendly function to create a perfectly balanced space. This home is approximately 4,300 square feet above grade plus an additional 1,900 square feet in the lower level. This home has an open concept floor plan that is centered on an eye-catching floating, brushed steel, walnut staircase that is encased in floor-to-ceiling glass. The kitchen is open to the family room, which has soaring ceilings and a floor-to-ceiling fireplace. The kitchen cabinets are a clean face, book-matched walnut with Caesarstone countertops. The back of the home is mostly floor-to-ceiling windows and glass doors that open up to a large covered porch — all of which step out to an in-ground pool. The main floor also features a good-sized, functional mud/laundry room off of the inside entry of the garage. There is also a main floor office with an oversized sliding door for privacy. This door can also easily be left open, making the room flow into the open concept main floor. Upstairs the master suite features a large walk-in closet as well as well as a spa-like master ensuite. The three additional bedrooms are generous in size and feature private ensuites with heated floors and finished with modern materials that create a warm atmosphere. 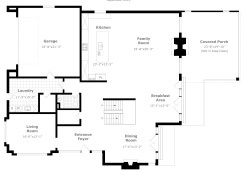 The lower level is fully finished with heated floors, a large recreation room, nanny suite, gym, and more. Great location within walking distance to Oakville Trafalgar High School and short drive to shops and GO Transit. You’ll be excited to call this warm and inviting space home.